Matteo Bianchi Studio and BAREL’s first collaboration. Trends may come and go, but the fundamental elements of design are timeless. There is a reason ‘classics’ are called just that. Whether it is their shape that suits any design, or their elementary material like wood, stone, or metal, that celebrates simple form; design classics will be in our home for generations. This month at Matteo Bianchi Studio, we are celebrating new classics. Furniture that is pared back but punchy. Uncomplicated and functional, yet beautifully finished. We call it The New Industrial. We have designed fantastic pieces for BAREL, inspired by the most recognisable steel frame construction – The Crittall window. 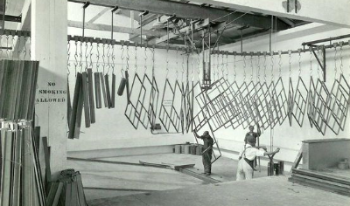 From a Mid -19th-century ironmongery plant in Essex, to its international manufacture through a post-war revolution, Crittall’s steel framed glazing is still an iconic British feature. Fast forward 100 years later to 1950’s Italy. In his humble workshop in Mondovi, Augustus Barel merged the art of forging iron with innovative design, and hence BAREL was born. Still a family-owned company, all pieces are created traditionally and finished by hand. Last week we launched the collection right in our studio, and thank you for all who attended the wonderful cocktail reception. It was a great night for all, especially to see our table centre stage. The inspiration for the came in the midst of designing a residential project where we wanted to marry two spaces seamlessly. We found there was a gap in the market for ‘light’ industrial furniture that didn’t overpower a space but had a contemporary reference. Taking a cue from the elegance of Crittall windows around us in England, the style was thus conceived. In the design stage (below), we explored and refined the precision and proportions that make this table so timelessly classic yet effortlessly modern. The total collection also includes coffee and side tables and accessories that complement any space with their refined simplicity. 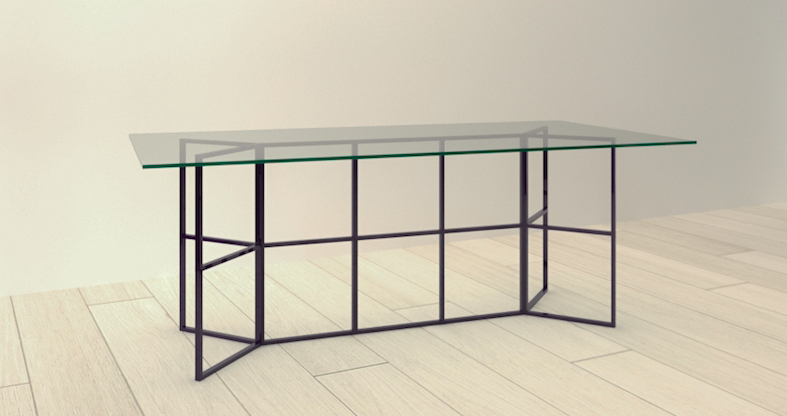 The table is constructed from forged iron, powder-coated to any colour; here below in a striking deep aubergine. And of course, if you are at a cross-road with your design ideas, perhaps the look of the new elegant, industrial style may be the answer, so feel free to contact us! Many happy returns from the team at Matteo Bianchi Studio.